The gospel is "good news" of a restored relationship with God. But according to Bock, today's proclamations seem more a therapeutic call or political polemic. Here he traces themes from Scripture to rediscover what the Bible says about the revelation of Christ and the role of the cross in a spiritually bereft world. Includes discussion questions. 176 pages, softcover from B&H. 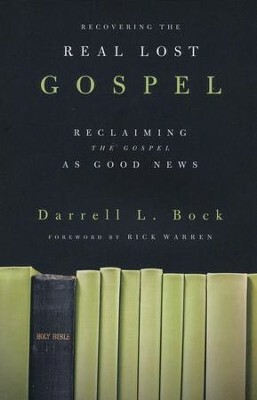 Darrell L. Bock is research professor of New Testament Studies and professor of Spiritual Development and Culture at Dallas Theological Seminary, a New York Times best-selling author, and a corresponding editor at large for Christianity Today magazine. I'm the author/artist and I want to review Recovering the Real Lost Gospel: Reclaiming the Gospel as Good News.